The only reason I liked Mizuno was because they sponsored Tirunesh Dibaba, who is my favorite runner and a great example of what forefoot running looks like. However, Mizuno shoes for forefoot strikers are hard to come by since Mizuno caters mostly to heel strike runners which is clearly evident by looking at the design of most of their shoes: the under-heel padding is enormous (below). Most Mizuno running shoes are made for a heel strike running style, which is why their shoes are made with thick, under-heel padding. This is futile for forefoot running because a stacked heel makes it challenging to land squarely on the forefoot. In my opinion, the only acceptable forefoot running shoe by Mizuno is the Wave Universe 5 (below): no heel, nice and flat and incredibly light. I prefer the Universe 5 over the Universe 3 because the 5’s are more minimal as per the lower heel. 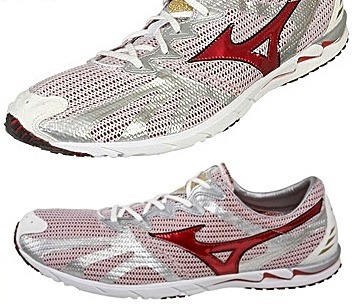 Above, the Mizuno Universe 3 has more under-heel protection and is less minimal than the Mizuno Universe 5. The Universe 3’s has a slightly built up heel composed of plastic materials to accommodate a heel strike landing. It’s best not to run forefoot in a shoe that has structural elements aimed more squarely at facilitating or encouraging heel strike. The Universe 5 is best known as a feather-light racing flat, weighing 4oz, very comparable in weight to the Vibram FiveFingers. The outsole is better organized for forefoot running (i.e. no plastic-wave heel like the 3’s) which is why many pure minimalist runners prefer the Universe 5’s. Another critical component of the lightness of the shoe is the ultra-thin upper mesh, allowing breathability and flexibility without compromising durability. The high degree of breathability of the upper makes the shoe great for running in the heat. The ‘perfect’ forefoot strike depends on plantar sensory feedback. The Universe 5, ideal for sharpening your forefoot strike, is a great alternative to the Vibram FiveFingers or barefoot-inspired running-sandals. Of course, if you are new to forefoot running and/or pure minimalist running, use logic and gradually work up to running in these shoes. In the meantime, walk as much as possible in them to speed up foot strengthening processes. The Mizuno Wave Universe 5 is my all time favorite running shoe. Nothing even comes close. Too bad they don’t make them anymore. They’re impossible to find anywhere.